Like always, I try to take suggestions for restaurants to visit, rather than just hoping to stumble across them at random. Multiple people have mentioned Iron Starr to me, but I decided to go when beloved professor Dr. Mark Reighard related how amazing the food was. Of course I would have to try it if an SNU legend was asking me to! I was expecting good food, but the level of excellence still came as a surprise. The atmosphere of Iron Starr was different than a barbeque restaurant normally feels. The interior had a modern twist of decorating, which gave the space a more luxurious tone. The lighting was a little dark, as the blinds were shut for most of the time we were there. Eventually the blinds were opened and this made a big difference, because the light was initially almost too dark. However, this wasn’t a huge annoyance. A Thursday night has potential to be a busy day for restaurants, but the dinner rush can be beaten if the timing is right. I brought my suite mate Brandon Hart with me, and we were seated quickly, just before a big surge of customers hit. Brandon has become a frequent traveler to these restaurants, and it is always nice to have someone who knows something of the restaurant business on the inside. As a waiter, he knows the amount of time that it should take for a meal to come out in relation to the number of guests there are at the time. I can also ask Brandon the occasional pricing question, depending on the portions that are being served. After we were seated, our orders were taken with no problem. Brandon mentioned to me that the wait for our orders seemed a bit long. Although there was a dinner crowd, the wait did seem to be a little on the lengthy side. Our drink glasses were filled fairly regularly, showing their attentiveness, so the waiting staff may not to be at fault for the slowness. Our food did arrive after around 40 minutes. Both Brandon and I ordered a meat combo, which came with two meats, two sides and cornbread. Brandon had the brisket and chicken with mac and cheese and green beans. I had the brisket and ribs with mac and cheese as well as fried okra. For around $13, this was a decent sized amount of food, but the quality that this was prepared with was phenomenal. 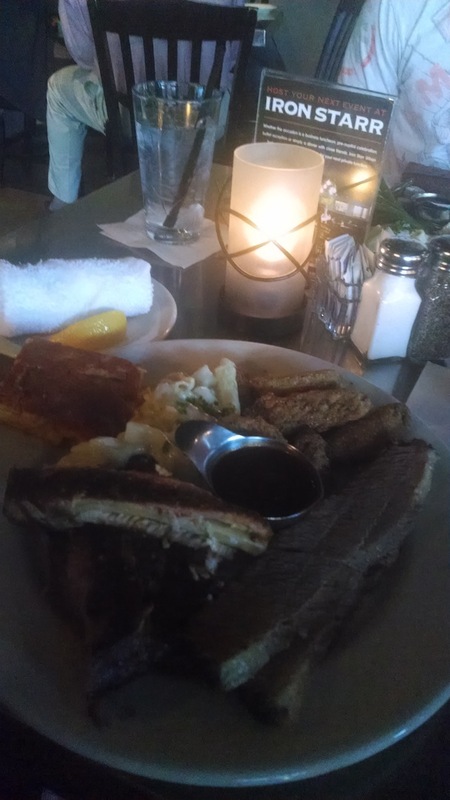 The brisket was cooked perfectly with a nice smoky flavor, the ribs had been prepared so that they literally fell off the bone when touched, and the okra and cornbread could not have been done better. However, the best part of this meal was the mac and cheese. I can honestly say that I have never had mac and cheese this good before, and this is absolutely no exaggeration. It was incredible. Iron Starr is located at 3700 N Shartel Ave, a bit of a drive from SNU, but completely worth the trip. This restaurant is in my personal Top 3 for barbeque that I have ever eaten. If there is ever a doubt as to whether or not to try a new restaurant, ease your concerns with a visit to this local BBQ favorite. I will be back to Iron Starr soon, no question about it.